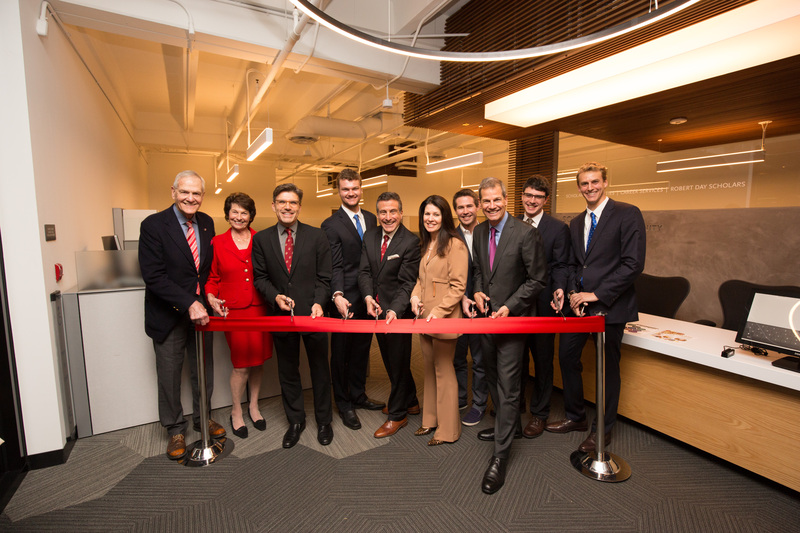 With a ribbon cutting and dedication ceremony on Friday, February 17, members of the CMC community celebrated the official opening of the newly renovated (and named) home for Career Services, the Sponsored Internship Program, and the growing Scholar Communities. The Center has been named after the Soll family who’s members include Bruce and wife Joy, along with sons Jason ’12, Evan ’15, and Adam ’17. Over three years ago, CMC President Hiram Chodosh and Associate Vice President and Dean for Student Opportunities Michelle Chamberlain, began a series of conversations about what Career Services could look like as CMC moves forward. “Through Hiram’s leadership, the generosity of our alumni and parents, especially with the Soll and Newman families, Trustees Ken Valach ’82 and Harry McMahon ’75 P’08 P’09, from those conversations the Soll Center became a reality,” Chamberlain said at Friday’s event. Those who enter the Soll Center for Student Opportunity will immediately notice the open design of the space. Workstations are open so staff and students are able to work together in real time, break down silos and share ideas. The Valach Family Lounge helps maintain the Soll Center’s connection to campus with large windows that look out to campus so students can flow in casually without an appointment. Other key features of the Soll Center include the R.G. Newman Conference Center, complete with video conferencing, and soundproof interview rooms allowing students to have on-campus interviews with employers either in-person or over Skype. The Center collaborates with other entities, such as alumni, parents, faculty, institutes and athletics. Together with its partners, the Soll Center connects students to internships, fellowships, graduate and professional programs, and post-graduate employment in business, government, and the professions. “The goal of this center is to help our students to translate, cultivate, and articulate their skills and their talents, especially in key areas that our CMC employers have told us are so important: the ability to bring complex problem solving and leadership into real-world opportunities,” Chamberlain said.